• Rio SX is feature laden with standard navigation, back up camera3, push- button start and 6-speed manual transmission. • High-spec Rio 5-door speaks to driving enthusiasts and was inspired by Kia’s first-year Rio B-spec racing program. Until now, driving enthusiasts couldn’t get their hands on the Rio they were most eager to own–that’s about to change. The 2013 Rio 5-door SX is now offered with a 6-speed manual transmission (M/T). Arriving in dealerships in limited quantity with a MSRP of just $17,9004, the Rio SX M/T is a fun-to-drive subcompact that satisfies enthusiasts’ desires for a more engaging drive experience without sacrificing the comfort and convenience offered by the subcompact model’s highest trim level. The Rio SX M/T is inspired by Kia’s championship winning motorsports efforts and the recently-introduced Rio B-spec race car. Enthusiasts should get in line now as less than 500 Rio SX M/Ts will be initially offered for sale during the 2013 model year. 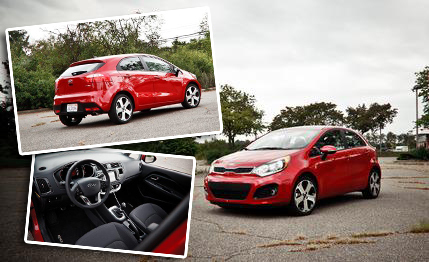 The 2013 Kia Rio SX with six-speed manual transmission is inspired by Kia’s B-Spec racing program. The Rio 5-door SX M/T comes standard with a class-leading 138 horsepower5 4-cylinder double- overhead cam gasoline direct-injection (GDI) engine featuring dual Continuously Variable Valve Timing (CVVT) and fuel economy of 30-mpg city/40-mpg highway6. The Rio 5-door SX M/T is available in Signal Red and Electronic Blue and comes with LED taillights, front LED accent lights, and 17-inch alloy wheels. Inside, the Rio SX M/T adds a seven-inch navigation touch screen with a SiriusXM™7 Traffic system and push-button start with Smart Key. Other standard SX features include sport-tuned suspension, rear camera display8, steering-wheel mounted audio controls, Bluetooth®9 wireless technology, and an AM/FM/CD/ MP3 SiriusXM Satellite audio system. The interior is handsomely appointed in sporty black knit cloth. “The Kia Rio 5-door SX M/T is perfect for driving enthusiasts who simply won’t compromise when it comes to certain features,” said Orth Hedrick, Director of Product Planning at Kia Motors America (KMA). Those looking for the inspiration behind the Rio 5-door SX M/T need look no further than the twisting, undulating macadam of America’s greatest road racing circuits. In addition to its championship winning professional road racing program, Kia this year entered the new B-Spec grassroots racing series, and the Rio SX M/T offers buyers the sporty driving dynamics that transfer from the track to the street. To advance from driving enthusiast to racer10, customers can purchase a 2013 Rio 5-door M/T (LX Trim) and a B-Spec performance kit11 available at a cost of $14,000 from Kia’s racing partner, Kinetic Motorsports. The kit includes everything needed to transform the street-loving Rio 5-door into a proper racecar: pre-cut roll cage, racing seat, quick-release steering wheel, racing harness, race shocks, lightweight wheels, spec-series tires, oil sump pan expansion kit and complete build instructions. For an additional fee, Kinetic will professionally assemble the Rio at their shop in Buford, Georgia. 1 Based on 5-year cumulative growth between 12-month retail sales for periods ending July 2007 and July 2012 of all U.S. automotive brands. 2 Special-edition 2013 Rio 5-Door SX M/T will have limited availability while supplies last. Vehicles will not be available in all regions. See your local Kia retailer for details. 3 Always drive safely and use caution when backing up. 4 MSRP excludes $750 destination and handling fee, title, taxes, license, options and dealer charges. Actual prices set by dealer and may vary. 5 Class-leading horsepower claim for 1.6L GDI engine based on comparison of 2012 and available 2013 subcompacts as of July 2012. 6 EPA fuel economy estimates for 2013 Rio equipped with Idle Stop and Go (ISG). Actual mileage will vary. 7 Sirius services require subscriptions, sold separately after 3-month trial included with vehicle purchase/lease. Subscriptions governed by SiriusXM Customer Agreement at siriusxm.com© 2011 SiriusXM Radio Inc. Sirius, XM and all related marks and logos are trademarks of SiriusXM Radio Inc.
8 The rear camera display is not a substitute for proper and safe backing-up procedures. Always drive safely and use caution when backing up. 9 The Bluetooth® word mark and logos are registered trademarks owned by Bluetooth SIG, Inc. and any use of such marks by Kia is under license. Other trademarks and tradenames are those of their respective owners. A compatible Bluetooth® wireless technology enabled cell phone is required to use Bluetooth® wireless technology. 10 Always drive safely and obey all traffic laws. 11 B-spec performance kit voids 10-year/100,000-mile limited powertrain warranty, five-year/60,000-mile limited basic warranty, five-year/100,000-mile anti-perforation warranty and five-year/60,000-mile roadside assistance.